Gov. 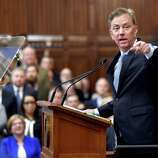 Ned Lamont offered clues to his first budget when he delivered the State of the State address. State income tax revenues surged upward again Tuesday, and this time it could be the middle class — not the wealthy — behind most of the gains. A new report from fiscal analysts projects overall revenues this fiscal year will surpass budgeted expectations by $464 million — an improvement of $204 million from a rosy revised forecast issued in mid-November. A surplus was already projected for this year, and the new forecast enlarges it. The consensus report from Gov. 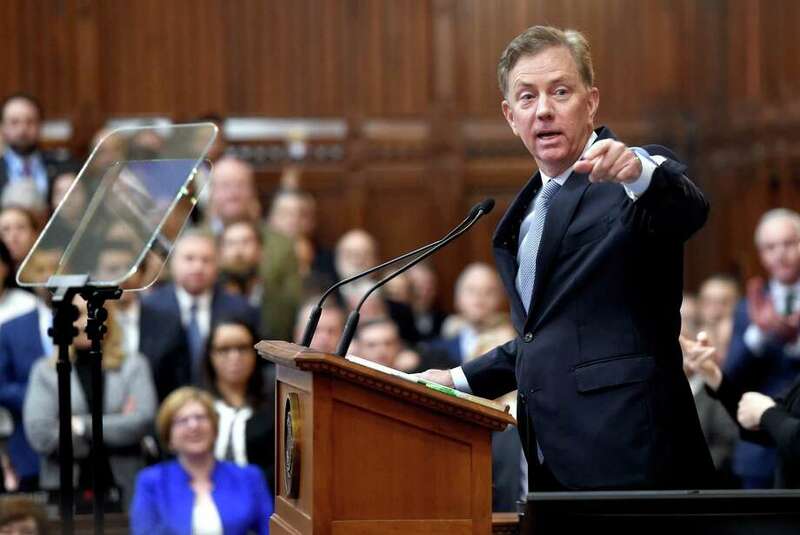 Ned Lamont’s budget staff and from the Legislature’s nonpartisan Office of Fiscal Analysis anticipates an additional $260 million in revenue for the 2019-20 fiscal year that starts July 1 — dropping the potential shortfall to less than $1.5 billion, from about $1.7 billion. Dan Haar: Did Lamont say unions must give more? Similarly, the latest projections add another $238 million in revenue to the 2020-21 deficit calculations, whittling the shortfall two fiscal years out closer to $2 billion. According to the new revenue report, receipts from the personal income tax — Connecticut’s single-largest source of revenue — have been upgraded by another $75 million for the current year, since the Nov. 10 forecast. But unlike most projections over the past 12 months, gains were not registered in the quarterly filings tied to capital gains, dividends and other investment related income that’s earned by wealthy taxpayers. This time around, the growth was in paycheck withholding, which represents about two-thirds of the overall $9.7 billion income tax revenue stream. While Connecticut’s wealthiest households pay the bulk of income tax connected with Wall Street, middle-income families are the chief contributors to the paycheck withholding portion. 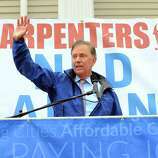 The report Tuesday continues a trend that brought an economic uptick in former Gov. Dannel P. Malloy’s final year in office. Income tax receipts, which frequently have fallen short of state officials’ expectations since the last recession ended in early 2010, have been doing the opposite. Unemployment in Connecticut fell to 4.1 percent in November and the number of new jobs in 2018, not yet fully reported, is on track to give the state its best year since 2007. Personal-income growth in the state matched or exceeded national growth for the second consecutive quarter. Overall economic growth also rebounded in the first half of the year, the latest measure available. In addition to income tax gains, the new forecast upgraded projections for the state’s second-largest source of revenue, the sales tax. Receipts for the current year are projected to come in $79 million higher than anticipated in mid-November. Analysts also projected modest growth in receipts from the corporation and inheritance taxes. The state’s share of video slot receipts from the tribal casinos in southeastern Connecticut is not declining as sharply as originally anticipated. Upticks in paycheck withholding and sales tax receipts typically are viewed as a good sign of sustained economic growth. Still, Senate Minority Leader Len Fasano, R-North Haven, urged caution, saying the state is far from in the clear. Fasano also warned that a recession could be coming, as most economists predict. 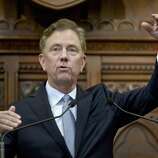 It remains unclear whether Lamont and the General Assembly can spend much of this projected windfall, given stringent new spending cap rules enacted in that budget Fasano mentioned, in late 2017. Regardless, Connecticut has a chance to build upon what appears likely to be a record-setting budget reserve. 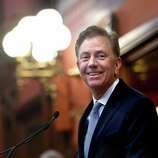 Connecticut held only about $200 million in its rainy day fund in late 2017, a cushion of slightly larger than 1 percent of annual operating costs. But over the past 15 months, Connecticut’s rainy day fund has exploded. It now approaches $1.2 billion. In addition, a special “volatility cap” program designed to force the state to save excess income tax receipts tied to investment earnings holds $648 million this fiscal year. These funds would be deposited into the reserve this fall. On top of that, Comptroller Kevin Lembo had projected the surplus for the current fiscal year at $242.4 million earlier this month. It now could rise to $446 million based upon the updated revenue projections. If this surplus is deposited into the rainy day fund, the total could approach $2.3 billion by the fall — a reserve of almost 12 percent. The largest reserve in state history involved nearly $1.4 billion held in 2008. At the time, it represented about 8 percent of annual operating expenses. Much of this growth in the reserve fund has been attributed to one-time factors, particularly changes in federal tax policy that led to changes in state income tax payments and a huge payment from hedge funds — which in turn led to a windfall at the start of 2018. Hearst columnist Dan Haar contributed to this report.